Decorative indoor stair treads provide steps and staircases a beautiful transformation. It comes in different colors, patterns, and sizes. Check out our buying guide and top 10 list on the best indoor stair treads as it's time for you to start protecting your home, family members, pets, and guests. If you don't already know, decorative indoor stair treads are small little rags fitted to individual steps of staircases. Their most important function is to protect the material of a staircase from constant traffic as family, friends, and pets go up and down. But, they also prevent you from falling and slipping on bare wooden or concrete steps, which would result in disaster and injuries. As mentioned above, stair treads for indoor use come in different sizes, colors, and patterns, so how can you pick the best set that will protect your home and your family? Keep on reading to find out. When choosing a material that makes up stair treads, pick the one that goes with your home's décor. Remember that your stair treads will be totally visible as you travel up and down the stairs. You'd want stair treads that don't clash with the wallpaper or paint of your walls and material of your staircase. The staircase is an area in your home that sees high traffic. So, check for durability in the treads that you'll purchase. The durability of fibers is measured from 1-5, with 5 as the most durable. Most homes only need a 2.5 scale of durability. For commercial spaces, 3 or 4 will be enough. Make sure that your stair treads adhere to your steps securely. Secure backing is necessary to prevent the rugs from sliding off your staircase and causing hazard within your home. If there's nothing at the back of the rugs, just secure the materials using double-sided tapes that are in wide strips. You're looking into adding decorative indoor stair treads into your home, so a set needs to look visually appealing when installed. To ensure your treads don't look off center, measure each step. Then, find the midpoint. Mark it using a grease pencil. Now, get your new home addition and fold it without pressing on the material. Align the stair tread's middle part with the marked midpoint of your steps. With these tips, you'll find the best stair treads for your home. Check out our best picks below! The first set on our list of the best decorative indoor stair treads comes in different colors, which are all beautiful. Skid-resistant, durable, and quick-drying, these staircase treads are also great for outdoor use as the polypropylene fiber face resists rotting and mildew development. As if all those features aren't enough, this set of 4 treads is also simple to clean using only a hose or vacuum. A set of 5 that's safe, protective, eco-friendly, versatile, and easy to maintain, it's top-rated as it's designed to increase grip and traction as you use your staircases. Its rubber material also offers a raised groove surface so water can run off easily. As it’s made for indoor and outdoor use, its material resists damage from elemental factors like snow, rain, and sunlight. If you are on the lookout for a stair tread set with the strongest, non-slip adhesive backing, then this is the best option for you. It guarantees a long-lasting grip that will prevent any movement which can cause injuries and/or surface damage. Each non-skip step mat is made of 100% polypropylene, a material that's both noise-absorbing and long-lasting. 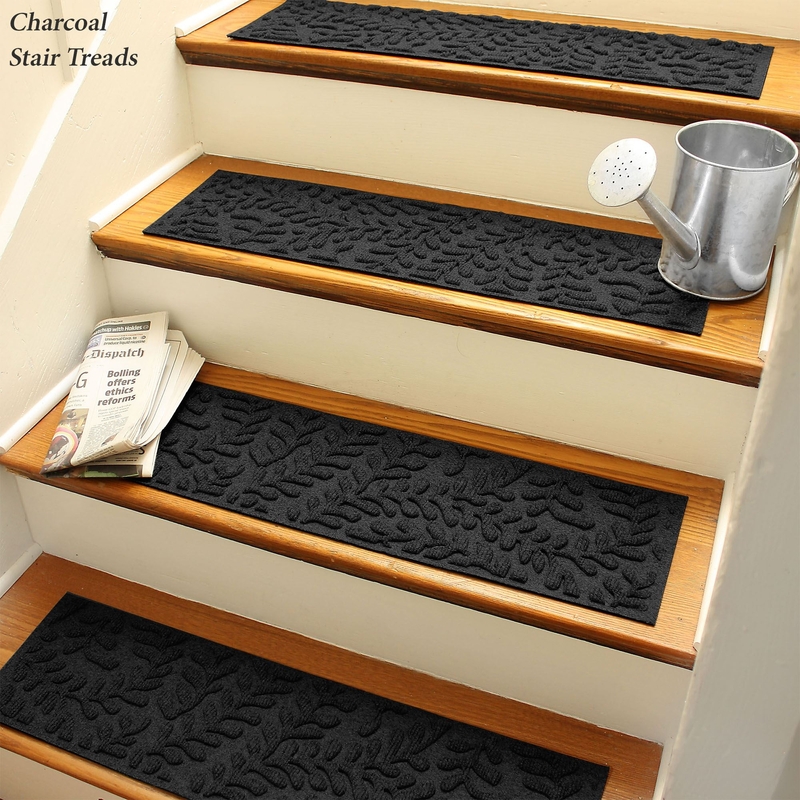 When you check the product's reviews, you'll see that the general consensus concerning this non-slip fashionable stair tread mat is that it's incredibly stunning, soft, and durable. It offers an instant facelift to staircases with its brilliantly braided material. Of course, it also offers the right amount of traction which will minimize accident risks. A set of 4 chic stair treads made with anti-static polypropylene, it is a good choice if you want mats that will provide charm and a firmer footing on your steps. Its elegant look and minimalist design allow it to match any home decor. Because of its durable and long-lasting synthetic fiber materials, water and slush will just drain through without causing any damage to the product. This one is great for providing your home a safety feature and curb appeal. The stair tread guarantees a 100% slip and skid free surface and offers you with an indoor/outdoor mat that resists mildew, fading, and staining effectively. The best aspect of this product is its geometric design which mimics old Mesoamerican art. Consisting of a comfortable and soft shaggy pile, it is a great alternative to stair runners. It cuts down on sound made when a staircase is used and it's incredibly easy to stick/install with its non-slip backing. The adhesive backing the product comes with provides enough grip that gluing, stapling, or nailing is no longer required. This one is our Best Budget Pick as the set comes with 13 family-friendly stair treads each made of nylon and polypropylene, materials that are durable and weather-resistant. Although the braided mats don't come with non-slip backing, you can easily stick them to your steps using a double-sided tape and they won't budge. What made us include this set in our list is the fact that each tread is reversible. Yes, you heard that right! Does your hardwood staircase need protection and some aesthetic enhancement? A set of Brannan Dark Beige Stair Tread from Alcott Hill is just the thing you need. The woven synthetic fiber materials and non-slip rubber backing of the mats are everything that make up the greatest mats to use on indoor staircases. But, those are not all this set offers as it also lends a clean-lined, rectangular silhouette to beautify your home. The low 0.2-inch synthetic fiber pile of each mat from this set of 13 treads offers protection against foot fatigue. This premium set gives protection to children, pets, and elderly people from falling and slipping. It's highly recommended for high traffic areas and it's compatible with any type of surface with its non-slip backing.